The most highly anticipated VIP party in Las Vegas is almost here! The Cosmo Casino & Resort is set to host a world class soiree for celebrities, news media, and a few Vegas locals that were lucky enough to score tickets. Some of the most prominent figures of our time will be in attendance and this will certainly be a night to remember. However, there is a situation. The city of Las Vegas has been terrorized by a serial ki..er with an MO of attending VIP events held on the strip. The ki..er, known as the Sin City Slayer, chooses victims from unsuspecting party guests. The Las Vegas police are currently working with federal agencies to catch this deranged predator. Hopefully, the ki..er doesn’t have a ticket to this event. This mystery dinner is a type of dinner theater in which the “show” is a m..der mystery, and the diners are invited to participate in solving the mystery as they eat, and mingle among each other. Everyone will be given a part to play, dinner and 1 drink ticket, and materials to help you solve the m..der. Your participation is important in this game! You could end up being the m..derer, the m..dered, or an innocent bystander. This is part of the fun. You will need to provide your own costume for your part (think suit, fedora, sparkly dress, furs, jewelry, etc.) and pay for any extra drinks (wine, beer or soda) outside of your complimentary drink. Tickets are on sale until March 28th, so purchase them soon! Sorry. Going to the film festival that night. 4/6/2019 5PM-9PM Tickets must be purchased by midnight Thursday March 28, 2019. 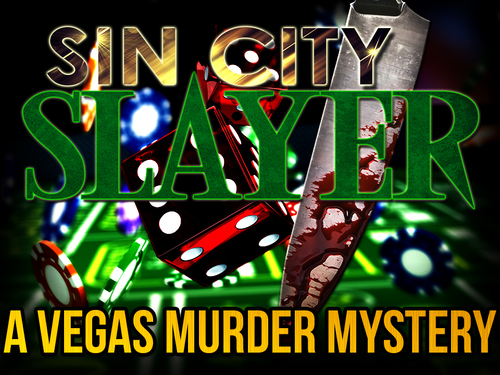 $45.00 includes dinner, one drink ticket, your part and clues, and a whole lot of fun with gambling and murder!